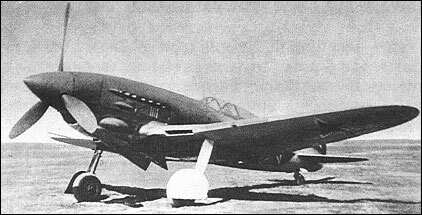 In 1941, the Polikarpov OKB began work on an Istrebitel' Tyazhely Pushechny - heavy cannon fighter - which was to mount a 37mm cannon between the cylinder banks of a 1,650hp Klimov M-107P 12- cylinder liquid-cooled Vee engine, and also carry two synchronised 20mm cannon. The aircraft was of mixed construction, the fuselage being a wooden monocoque and the wing of steel and dural. The first prototype, referred to as the M-1, was completed in October 1941, but difficulties with the engine delayed the initiation of flight testing until 23 February 1942. An M-107A replaced the M-107P late in 1942, but engine difficulties were still experienced, and a second prototype, the M-2, was completed with an AM-37 engine of 1,400hp with which it flew on 23 November 1943. The M-2 had an armament of three 20mm cannon and eight RS-82 unguided rocket projectiles, the engine eventually being replaced by an AM-39 of 1,700hp. Factory flight testing continued until June 1944 when the programme was abandoned. The 37mm cannon had a very slow rate of fire. Aiming was said to be difficult. But probly hard (very) to fly other than straightahead .